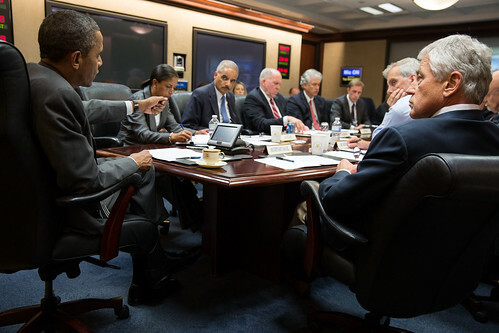 The Obama administration will brief lawmakers on Syria in an unclassified teleconference call at 6pm Thursday. Secretary of State John Kerry, Secretary of Defense Chuck Hagel, National Security Advisor Susan Rice, Director of National Intelligence James Clapper and deputy Chairman of the Joint Chiefs of Staff James A. Winnefeld Jr. are expected to be on the call, Hill sources said. The briefing was originally going to be classified which would have required members not in Washington to travel to a federal building with a secure line. But several lawmakers were apparently traveling and did not think they could get to a classified line, Hill sources say, and the briefing was changed to unclassified to accommodate them. Among those who didn’t think they could get to a classified line, Hill sources said, were Majority Whip Eric Cantor (R-VA), who was reportedly fundraising in North Dakota and Ohio Wednesday. (A spokesman for Cantor did not immediately respond to a query.) House Speaker John Boehner (R-Ohio) was traveling in Montana, but an aide said it was not the case that he could not get to a secure line for the Syria call. “Some other members may have had such an issue but it was not one for the speaker,” Brendan Buck, spokesman for Boehner, said by email Thursday. Boehner sent President Obama a detailed letter (.pdf) Wednesday affirming the president's prerogative to act against Syria’s alleged chemical weapons use, but seeking more clarification on the U.S. military strategy and legal justification for Syria action. “It is essential that you provide a clear, unambiguous explanation of how military action – which is a means, not a policy – will secure U.S. objectives and how it fits into your overall policy,” Boehner wrote Obama. “I respectfully request that you, as our country’s commander-in-chief, personally make the case to the American people and Congress for how potential military action will secure American national security interests, preserve America’s credibility, deter the future use of chemical weapons, and, critically, be a part of our broader policy and strategy. The Obama administration- Congressional consultations on Syria are, however, so far positively tame compared to what ally British Prime Minister David Cameron has experienced from British parliament, still haunted by the Ira war. The UK Joint Intelligence Committee released a unanimous assessment Thursday that said, in short, no one else could have conducted the Syrian chemical weapons attack except Syrian regime forces, and that they assessed the Assad regime had used chemical weapons 14 times previously in the conflict on a small scale before the much larger Aug. 21 attack in Ghouta that killed over 300 people. Despite the assessments, British public opinion is wary of getting involved, and Labour leader Ed Miliband urged Cameron at a parliament debate Thursday to delay any action on Syria until further verification from the United Nations chemical weapons inspections team and another UN Security Council debate. Cameron has agreed not to act before UN inspectors return from Syria on Saturday and report back to the UN Security Council some time next week. The British parliament would then in theory vote on whether to authorize the UK to act. The thinking is that the Russians may be prepared to bail on the Assad family if remnants of the regime can be included in a transition allowing Moscow to maintain its influence. This variation of the Yemeni approach, which is to squeeze out the autocrat but leave some of the old regime in place, may be worth a try. But the odds are long for its success. First, it’s not at all clear that Russian President Vladimir Putin, having seen Russia diddled by the Americans and Europeans on the Libyan intervention will want to be played the fool again. … Indeed, Russia’s insistence that Iran be brought in as part of a new contact group suggests that Putin is in no hurry to solve the Syria problem.